Alphabet is currently planning on retaining its crown as the top information provider through Google products but the company has a long way to go when it comes to voice search. Alphabet subsidiary Google is one of the major tech companies that are currently competing against each other to take the lead in voice search technology. The company has a huge advantage over the competition as far as language and search capabilities are concerned. However, the software and tech giant still has a long way to go considering that its competitors had an early start in hardware for voice search. Other than Google’s late entry into the voice search technology front, the company has to deal with competition from the likes of Amazon and Apple. Apple brought Siri into its iPhones years ago and Amazon introduced the Echo and Echo dot devices which are powered by the Alexa software. These two companies have already secured a strong lead in the voice search technology, thus making it even tougher for Google to get ahead of the competition. Google is strongly rooted into advertising on its platforms but voice search means it will be entering into this category means it will be dipping its feet into waters that are not friendly to its main business. However, Google has to venture into the voice search technology since it is rapidly being adopted as a means to interact with artificial intelligence. The company can therefore not afford to be left behind. Despite its late entry, Google has been employing an aggressive strategy that includes introducing its own digital assistant for Android handsets. It also introduced the Google Home device which competes directly with the Amazon Echo devices. Unfortunately, AI does not exactly fall into the company’s advertising business making it hard to generate revenue from it. However, the firm will work things out along the road. In the meantime, it aims to secure a presence in voice search by offering products that will compete with the rivals, thus making sure that it does not miss out on such an important tech sector. 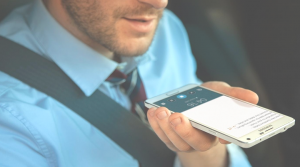 Voice search is still in its early stages and analysts believe that it still has a long way to go, especially now that new technologies are rapidly coming up. Alphabet stock closed the latest trading session on Friday at $955.14 after plummeting by 0.08 percent from the value of the stock during the previous stock.